Adobe is touting the Mercury Graphics Engine (MGE) as a key element of Photoshop CS6. What caught our attention is the statement, "MGE is new to Photoshop CS6, and uses both the OpenGL and OpenCL frameworks. It does not use the proprietary CUDA framework from nVidia." They add, "...this new engine delivers near-instant results when editing with key tools such as Liquify, Warp, Lighting Effects and the Oil Paint filter." We ran tests using Iris Blur and Liquify to measure the ability of the graphic processing unit (GPU) to do functions that the CPU used to struggle to complete. We defined a small area in the middle of our image and rendered using default settings except for defining the Iris Blur as 500 pixels. Time is in seconds. Shortest bar means fastest. We distorted our sample image with 8 strokes of our 600 pixel brush size with 100% pressure. Then we rendered it. As long as GPU acceleration was enabled, all the Mac Pro compatible GPUs rendered this filter quickly. In two cases we disabled the GPU acceleration to show how long it takes the CPU to complete the render. The times below are to the nearest tenth of a second. Shorter bar is faster. Both the Mac Pro and MacBook Pro were running OS X 10.7.4. The Mac Pro had 24GB of RAM. The MacBook Pro had 16GB of RAM. WHAT ABOUT CS5 versus CS6? In case you are wondering how Photoshop CS6 compares to CS5, we could not show you Iris Blur since CS5 doesn't come with it, but here is a graph showing how the five GPUs we tested compare rendering the Liquify example -- all with GPU acceleration enabled. 1. When we first ran the Iris Blur, we were getting slow times for the AMD cards on the Mac Pro. We finally figured out that "Use OpenCL" was not checked in the Photoshop > Preferences > Performance > Graphics Processor > Advanced Settings. If it is grayed out, your GPU does not support OpenCL. The new blur filters (Field Blur, Iris Blur, and Tilt Shift) require support of OpenCL v1.1 to accelerate. 2. As you can see from the "Iris Blur" graph, the NVIDIA GeForce GTX 285 supports OpenCL while the Quadro 4000 and GeForce GT120 do not. 3. 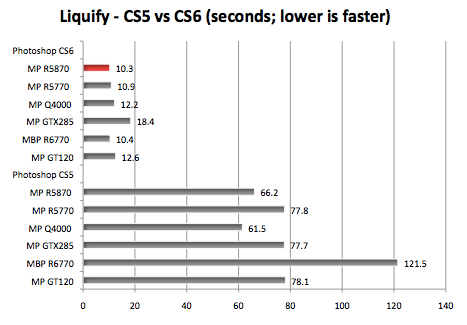 As you can see in the "Liquify - CS5 vs CS6" graph, there is a big jump in render speed of a filter like Liquify when you upgrade from Photoshop CS5 to CS6. 4. Not all filters are GPU accelerated. For example, Reduce Noise is primarily a CPU function. For more details on what filters and functions are accelerated by the GPU, consult this FAQ by Adobe Support. 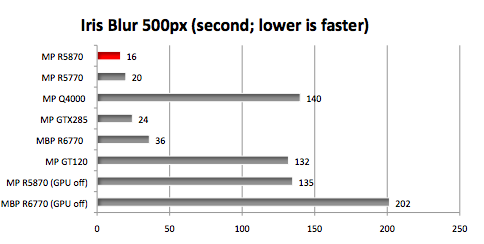 OVERALL, Photoshop CS6's use of GPU acceleration is impressive. It is a strong argument to upgrade -- especially if you use filters and functions that are helped by the Mercury Graphics Engine.